Hwy 101 mile marker 167. 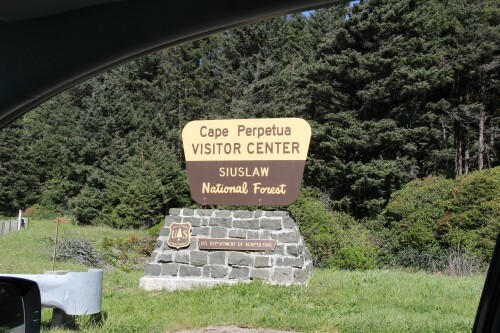 Cape Perpetua Scenic Area is a U.S. Forest Service park, and is part of the Suislaw National Forest. There is a large visitor's center with displays and occasional presentations. This center - with its knowedgeable staff - is a good place to obtain the passes that are necessary for the various parks and units along the coast. The area features about 20 different hiking trails, one of which leads to Devils Churn beach. But the most interesting is the one that leads to Cove Beach. This leads to the "Spouting Horn", "Thor's Well", and an expanse of rugged volcanic rock through which several channels have been carved by the waves..
Site Resources: Staffed Visitor's Center, restroom. 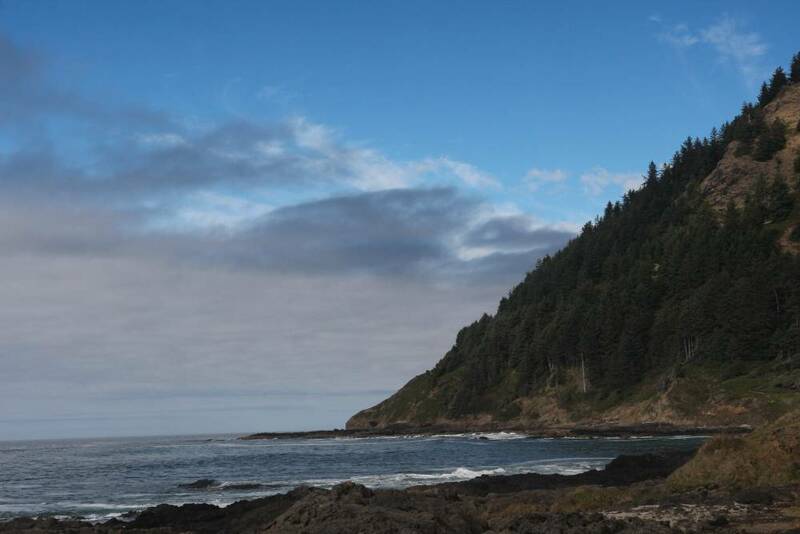 U.S. Forest Service link:Cape Perpetua US Forest Service pass (or similiar permit) required. Here's a shot looking up at the cliff. There is actually a hiking trail at the top, and you can see hikers up there from time to time. 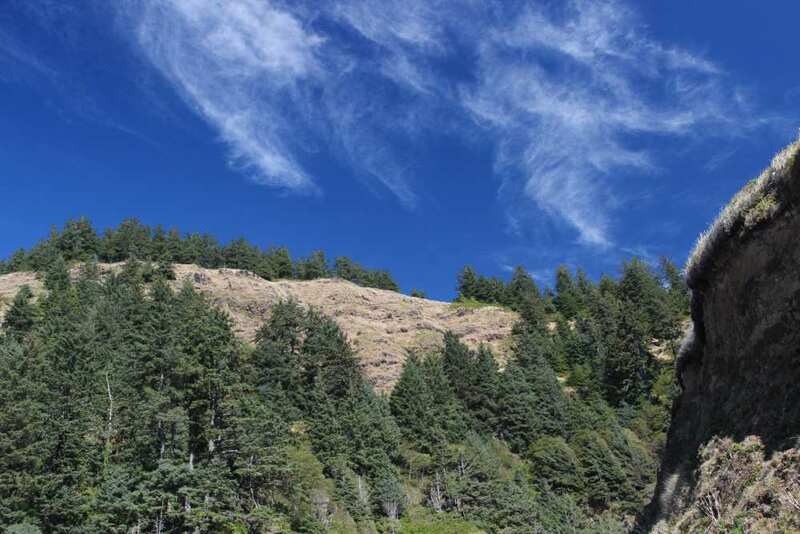 The Captain Cove trail from the visitor's center leads through a tunnel under hwy 101, and ends in several viewing areas overlooking the volcanic rocks. There are two access areas that allow you to walk out on these rocks, which are highly irregular and tough to walk on.. This view is from higher up on Captain Cove trail. In the distance is the Devil's Churn area. 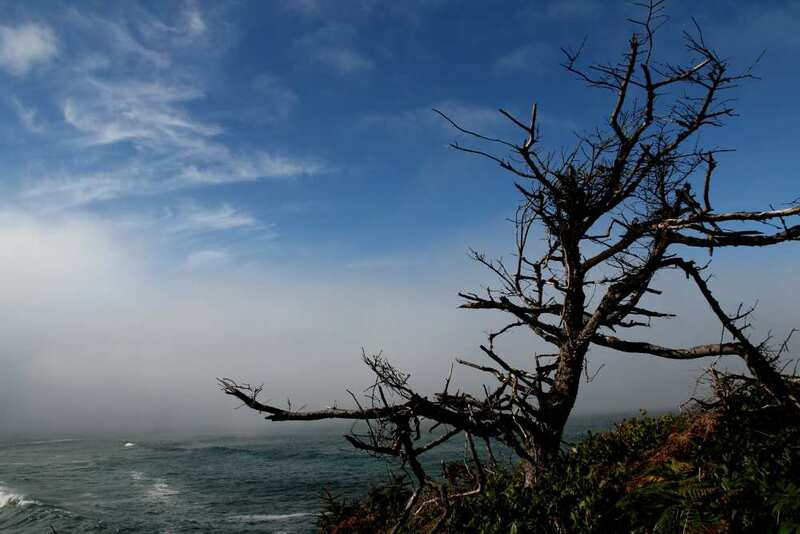 This can actually be reached by a trail that winds along the headlands between Cape Perpetua and Devil's Churn. Although it looks far away, the hike is about 15-20 minutes. 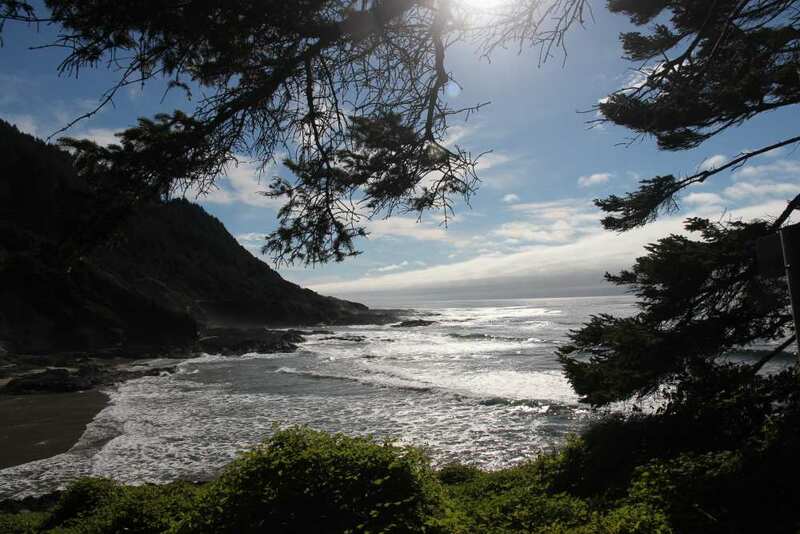 Between Cape Perpetua and Devil's Churn is an accessible beach. Here's a view of the beach from the trail described in the previous photo.